WHAT'S A RAPTOR REHABILITATOR? AND WHY? 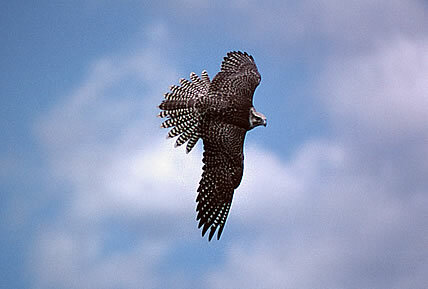 The Wingmasters partnership is composed of two Massachusetts-based raptor rehabilitators. One is Jim Parks, who took the photographs that appear on this website. The other is Julie Collier, who wrote and illustrated the articles for the site, including this one. Jim and I are licensed both by the federal government and by the Commonwealth of Massachusetts to take care of raptors that can't take care of themselves. Like many other wildlife rehabilitators who have chosen to care for one particular group of animals, we specialize. In our case the specialty is raptors - eagles, hawks, falcons, owls, vultures and ospreys. Still, our ultimate goal is precisely the same as that of other wildlife rehabilitators, whether they're working with marine mammals or reptiles or songbirds. Our objective is to provide a raptor with whatever care is necessary to restore it to good health and then to return it to the wild. A wildlife rehabilitator might be defined as a person who restores a sick or injured wild animal to a healthy condition. It could be assumed from this definition that rehabilitation involves medical treatment of some type, from medication to physical therapy. Yet many of the raptors Jim and I care for require little or no medical assistance. Every spring and summer we end up with several young birds of prey that have become orphaned or homeless, usually both. Some are tiny babies when their nest tree is cut down or their nest is blown apart by a storm. Many survive the disaster uninjured (Baby birds in general are lightweight and wrapped in a protective coat of down, so if they're ejected from their nest by an accident they tend to bounce unhurt to the ground.) and our task then is to raise these babies to healthy adulthood with as little human interference as possible. That is easier said than done. 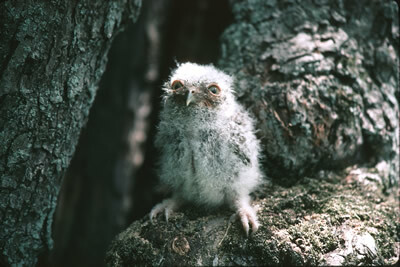 For starters, baby raptors, especially baby owls, are outrageously cute little fuzzballs with outsized feet. When they're asleep, which is most of the time, they lie on their tummies with their necks and heads stretched out. Adult raptors, by contrast, sleep standing up, so the first time I saw a sleeping baby raptor I thought it was dead. When baby raptors are awake, they spend much of their time sitting on their fuzzy little butts with their huge feet stuck out in front. Trouble is, these cuddly-looking babies should be handled as little as possible. The more exposure they have to people, the more likely they are to imprint, to come to believe that they and their human caregivers are family. Once a young bird has made this association between itself and people, any possibility of a normal life in the wild is lost. An imprinted bird doesn't think of itself as a bird and so it looks to people to provide food and companionship. An imprinted bird will not mate with another bird of its own species, preferring a human mate. Which can lead to complications that are outside the scope of this article to describe. Thank goodness. Just how do Jim and I feed baby raptors if we shouldn't be handling them? After all, baby raptors are like other babies - they need to be fed often. The solution is a sock puppet, handmade in the image of the species being fed. We hold the food between our thumb and the other digits, which forms the mouth of the puppet. The baby raptor sees only the face of what appears to be its parent, and readily takes the food from its parent's "beak." There are two problems to parenting with a puppet. One is that baby raptor food is typically minced mouse, warmed in the microwave. A three AM feeding complete with puppet and warmed-up mouse bits is not my pastime of choice. The other hitch is that as the babies grow rapidly in size and strength, they become very aggressive at feeding time. Instead of gently taking food from the puppet's mouth, now the developing raptors attack it, snatching away their share. In the wild this combative behavior ensures that the strongest babies get fed first, so if food is scarce at least the strongest ones will survive. In a rehabilitation cage it means that the sock puppet and my hand inside it take a real beating. It's easy to make a new puppet, but I've yet to find a way to replace badly bitten fingers. There's another, better solution to the feeding problem, although unlike a sock puppet it can't be custom-made to a rehabilitator's specifications. If a baby raptor must be raised in captivity, the best foster parent is not a rehabilitator but a nurturing adult of its own species. Usually this would be a female, since among raptors it is always the females who feed the young while the males hunt for the family. I have heard of a few cases where males stepped in to raise a family alone, but have never observed this myself. Jim and I are also licensed to provide a home for nonreleasable, permanently handicapped birds of prey and to use them for educational programs. Very few of these birds, however, have ever shown any interest in caring for young. Most of our permanent residents were injured as young birds and have been with us so long they have no interest in their own species. Jim and I are now working toward having a large raptor center where we can house proven foster mothers of various species. Until that happy day we'll have to stick with sock puppets and our own battered fingers. Whether a raptor rehabilitator feeds a young raptor using a foster parent bird or a sock puppet, the fact remains that the best a rehabilitator can provide is always going to be second-best to a natural childhood in the wild. With this in mind, Jim and I ask a lot of questions when people call us to report that they've found a sick or injured bird of prey. Now, maybe the bird in question does truly have a problem, in which case we'll step in. But maybe it doesn't. Every summer we field several calls describing raptors that must be injured, "because they're just standing there on the ground!" In most cases there's nothing wrong with these birds, and for a reason connected with the way raptors develop. Birds can't fly until their flight feathers have grown in completely. In the case of raptors this may be take several weeks. Shortly before their flight feathers have finished growing, young raptors leave the nest and clamber around on branches. 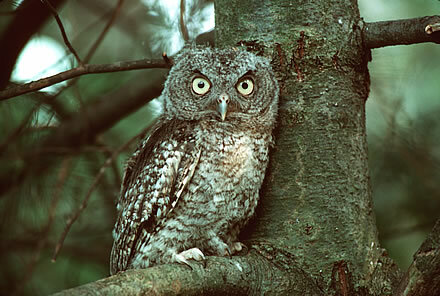 At this stage they are called branchers - old and strong enough to leave the nest but not well-developed enough to fly. The parent birds feed the branchers wherever the young birds perch, whether that's on a branch or on the ground. The parent birds continue to guard their active offspring, even though they may not be obvious. This branching stage is a necessary part of a young raptor's development. It must move around and exercise its wings in order to fly. However, branching behavior can bring the young raptors into contact with well-meaning people who assume they're injured. All too often branchers end up in captivity, not through need but through ignorance. Part of Jim's and my work as raptor rehabilitators is to make sure that a bird is truly in need of care before we remove it from the wild. I always feel a strange sense of victory when I've assessed a situation and realized that this particular raptor doesn't need me. Usually that's because the bird is a brancher, close to flight but not quite there yet. Some branchers do end up injured, because this betwixt-and-between period of their development means they've left the safety of the nest but haven't yet achieved the safety of flight. Many of the smaller raptors, like American kestrels and screech owls, are mauled by cats. Sad to say, millions of small wild animals are killed every year in this country by house cats. Some are feral cats, abandoned by their owners and forced to hunt for a living, but many are well-fed pets that are allowed to roam. While many of the problems confronting raptors are complicated and without easy solutions, the cat issue would be much less serious if more pet owners would take responsibility for their cats. What other problems do raptors face in the wild? The majority of raptors we care for are the victims of impact injuries - they have collided with vehicles, windows, power lines and, in recent years, communication towers. Another category is poisoning, often from pesticides; still another is illegal shooting. Disease is an infrequent problem, since raptors are free of many of the illnesses (such as rabies and sarcoptic mange) that plague wild mammals. Raptors do not appear to be particularly susceptible to the West Nile virus in the way that crows and blue jays are. Driving all the problems mentioned above is the biggest threat to wildlife in this country, or any country - habitat loss. Loss of their habitat is often the reason the raptors we care for and care about end up in trouble. As development and human activity drive the birds out of hunting territories they have learned to know intimately, they become easy targets for other predators. Disoriented and confused in an unfamiliar environment, they may collide with obstacles they've never encountered before. Deprived of their food supply, weakened by stress, they may fall prey to opportunistic diseases. Or to people with guns and inappropriate ideas about what to shoot. Habitat loss is a problem that is only going to get worse as development takes over former fields and woods. Sometimes the caller does understand that Jim and I handle only raptors, but is a bit hazy about what a raptor is. Off we go to rescue what this person has assured us is a bird of prey, only to find ourselves confronting a duck. Or a woodpecker. Or, on one particularly trying occasion, a plastic owl decoy that the caller was sure must be in trouble because it wasn't moving. There's a widespread but mistaken notion that any large bird must be a raptor, probably an eagle, which is why on two occasions I set out to rescue what callers had reported as eagles, only to find myself facing injured great blue herons. These are not raptors, but they certainly are formidable. 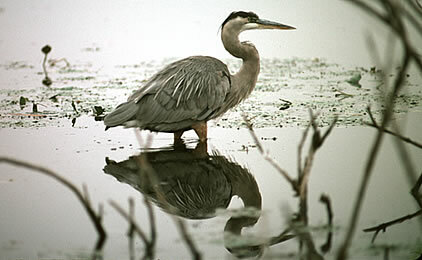 A great blue heron can stand four feet high and have a wingspan that stretches seven feet. The bird is also equipped with a stiletto beak for spearing prey, which it doesn't hesitate to use on a would-be rescuer. It's my impression that when a heron strikes at a person with that beak, it deliberately aims for the eyes. I hope never to see my theory proved right. One memorable day the usual pattern was reversed, and a bird that had been reported as a red-tailed hawk turned out to be a bald eagle. On a rooftop. It didn't occur to me until I was up on the crest of the roof, crawling toward the by-now thoroughly alarmed eagle that carrying a massive and struggling bird down a ladder might present a few problems. Fortunately, at that point the eagle resolved the issue by gliding down to the ground, where I was able to catch him a few minutes later. This bird turned out to be a first-year bald eagle that probably had never learned to hunt effectively. Sick and starving, the eagle was literally crawling with lice, which soon were crawling over me. After driving him to Tufts Wildlife Clinic in North Grafton and helping the staff to examine him, I drove back home to Springfield, scratching all the way. Once home I had to shower and shampoo thoroughly, launder my clothing, and then disinfect the eagle's transport box, the gloves I'd used to handle him and my van. Don't ever get the idea that raptor rehabilitation is glamorous work. 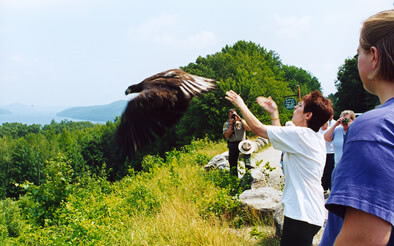 That eagle recovered rapidly, and several weeks later, along with some Wildlife Clinic staffers and state officials, Jim and I released him at the Quabbin Reservoir. The eagle was banded with a numbered aluminum ring fitted around one leg, something we do with all the raptors we release. If the birds are found by someone else, the recorded number on the band will tell that person where and when the bird was banded. This gives us information on how far the birds travel and how long they live. Years ago I rescued an injured peregrine falcon here in Springfield that was wearing an unfamiliar bright blue band. I knew from the band that this wasn't a Massachusett-born peregrine, but it wasn't until we researched the band number that we realized how much of a wanderer this peregrine was. Turned out he'd been banded earlier that year in Greenland! While our released raptors may ultimately provide us with extra data on their wanderings and longevity, there's one thing they're never going to give us, and that's gratitude. Once they're released, the birds leave our hands and never look back - which is the way it should be. We neither expect nor want our released birds to return to us, because that would indicate that they're socialized to people, something that would work against them in the wild. We may spend a day or two before a scheduled release banging pots and pans near the bird, or running toward it again and again, yelling madly. For its own safety, a wild raptor needs to fear humans. Making sure that fear is firmly implanted in the bird's mind is not enjoyable, but it's part of a rehabilitator's job. Can rehabilitation really be called a job, in the sense of making a living doing it? For many rehabbers their rehabilitation work is a responsibility they've taken on voluntarily, on top of a regular job that pays the bills. For Jim and me, working with birds of prey is indeed a full-time job, of which rehab is one facet. There was a time when both of us had company desk jobs, and we had settled lives and regular hours, with salaries and benefits. So what do we do now? Many people assume that since we are licensed by the government we must be supported, at least in part, by the government. We are not. Being licensed by the government means that we have passed a state-administered exam that proves our competence as rehabilitators, and that we keep government-mandated records of our work. Expenses incurred are our responsibility. Jim and I have solved the problem of supporting our rehab efforts by giving educational programs with nonreleasable birds of prey, raptors left with permanent handicaps. This work pays for a roof over our heads, the vans we drive to programs, the birds' caging and their food. It does not pay for a retirement fund, and we are well aware that we will have to keep working until we fall over. On the other hand, most people retire so they can finally do what they really want. We're doing what we really want right now. Earlier in this article I mentioned Tufts Wildlife Clinic, part of Tufts University School of Veterinary Medicine in North Grafton, Massachusetts. Wingmasters is very fortunate to have a knowledgeable staff of wildlife experts right here in this state, because most veterinarians have had little or no experience with raptors. Some don't want to acquire any experience. So if we pick up a raptor with serious injuries, Jim and I rely on the Wildlife Clinic. Neither of us has any formal veterinary training, and while we can deal effectively with the majority of cases we encounter, complicated or serious cases require the services of a veterinarian. I acquired my rehab skills by apprenticing many years ago with a man who was both a licensed falconer and raptor rehabilitator. Jim in his turn worked hands-on with me before getting his rehab license. Rehabilitation skills should be learned by working with an experienced rehabber, and the learning never stops. Does it really do any good, all this? Are we really making a difference? Not in the natural world, no. Saving the life of a red-tailed hawk is not going to affect the species for better or worse. But it's going to affect me, and all the other people who help to save that bird, for the better. I simply can't sit by and not help a raptor in distress. The same is true of thousands of raptor rehabilitators across the country. The same is true of hundreds of thousands of laypeople who call those rehabbers because they're concerned about the fate of a bird of prey. Rehabilitation work gives all of us, whether we're in the thick of things doing the medical work or on the periphery, phoning in a report of an injured animal, a chance to act on our human desire to help the helpless. This desire is part of what is best in the human spirit. If we do not have this opportunity, we lose part of what it means to be human. And humane. There are those who say that by repairing a raptor's injury and releasing it, we are releasing a loser, a bird that was injured because it wasn't up to Darwinian standards. This bird, the critics say, should not be allowed to contribute to the gene pool. My response to that line of thinking is this: Almost every raptor Jim and I care for owes its problem to human activity. The activity may be overtly malicious, as is the case with illegal shooting. Far more often it's passive, as when the birds collide with things we build, or are poisoned by the chemicals we use to grow our crops or keep our lawns green. Without meaning to, we have become agents of mayhem in the natural world. We are, in fact, making the natural world increasingly unnatural. We have a responsibility to undo at least some of the damage we cause. Jim and I feel a further responsibility, and that is to communicate, to the best of our ability, why raptors matter. This goes beyond mere fact-giving. The Wingmasters team goes to a different school every schoolday with several of our nonreleasable birds of prey. As we show them to schoolchildren we discuss each species' special hunting adaptations, how eagles differ from hawks which differ from falcons, what sets owls apart from all other raptors. Underlying all the talk is a powerful, unspoken message: WE CARE ABOUT THESE BIRDS. To demonstrate that, to show it to children, is one of the most important things we can do for the future of raptors. Our nonreleasable birds are our most effective tool in communicating a related message to children: RAPTORS MATTER. Schoolchildren today, thanks to the Internet, have access to more raw data than any other group of people at any time in this planet's history. They also, thanks in part to that same Internet, are more removed from the natural world than any other group of people at any time in history. The implications of this lack of connection with nature are profound. If children have no natural connection with nature, they can't value it, and if they can't value it they won't see any reason to protect it. When today's children are tomorrow's decision-makers, will they value the environment enough to preserve it? The sight of a live golden eagle or a great horned owl at a program can help to form a bond between kids and the world beyond their doorsteps. Our live birds of prey are citizens of that larger world, in front of an audience as a way of bringing that larger world closer. If a picture is worth one thousand words, a live bird of prey seen at close range is worth volumes of verbiage. Including my own.